Lion’s Head (Cape Town) trail map. The Lion’s Head hiking trail is 5.5 km both ways. The 5.5 km hiking trail is a round loop. Two different routes to reach the top of Lion’s Head mountain are available. Lion’s Head routes to choose from include the Chains and the Spiral Route. Each route has a unique set of turns and twists. The end is the spectacular panoramic mountain top of Lion’s Head. The mountain top overlooks the city of Cape Town. The hike has taken you on a journey up the tail, back and mane of the Lion. On it’s head there will be photographs to be taken and sights to behold. Different map routes to hike Lion’s Head (Cape Town). The two routes are carefully selected based on fear of heights and technical ability. The two routes have elements for both beginner and advanced. The route that is more technical is called the Chains. The Chains of Lion’s Head mountain is for the fearless of heights. The rock formation on the Chains route is far more challenging than the Spiral Route of Lion’s Head. This makes for some solid rock maneuvering. Be careful! This route has been known to be a bit on the steep side for either the way up or the decent. A guide is strongly advised if you would like to adhere to the Lion’s Head mountain safety guidelines. The Spiral route is also known as the recommended route for Lion’s head. The Spiral route takes a little longer than the Chains route, weaving it’s way around the mountain instead of directly upwards. The Spiral route is best for beginners or otherwise for hikers with a fear of heights. Ample time is provided by your guide for this route and we take the utmost care in avoiding the dangers of Lion’s Head mountain. If you are hiking alone or would simply like to experience the best hike without the added effort of selecting your routes, book a hike! We are here for your needs and plan the route to your technical skill level and abilities. When a routes map is not enough to hike Lion’s Head. Certain times a map of Lion’s Head is not enough. There is some hiking trails that do require a guide on Lion’s Head and Table Mountain. For these technical hikes it would be strongly recommended to use the services of a hiking guide. If you would like to use a map to hike up Lion’s Head, then it would be better to find a knowledgeable hiking partner. This is because Lion’s head trails are not well demarcated on the map. Getting lost is the last situation that you would like to find yourself in. However if you are set in hiking Lion’s Head alone, common sense would be a must. Should you hike Lion’s Head with or without a trail map? It is always recommended to start hiking an unknown path with an idea of the route you will be taking. Lion’s Head path is a route that you should take only when there are other hikers around to look out for you. There are limited signs demarcating the Lion’s head path. 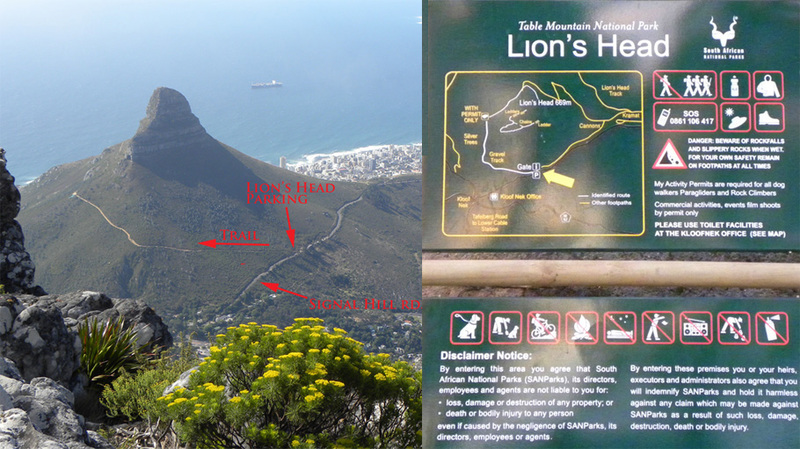 The signs start at the Lion’s head entrance, there you will find a introductory map and a landmark notice. After that it’s all up to you to reach the second and sign that will take you on one of two different routes. The Lion’s Head Spiral route and the Lion’s Head Chains route. If you are hiking with one of our guides, the different routes will be clearly explained and also you will get juicy insight into the history of Lion’s Head. If having fun and hiking safely is how you would like to hike then look no further, our support is here to take your booking and answer questions. Guided hikes up Lion’s Head mountain without a trail map. We don’t need a trail map for Lion’s Head hikes. Why? Because all of the trails we do on a regular basis are second nature to us. We live on the mountain and spend a fair amount of time planning and getting to know different routes on Lion’s Head. Our hikes are planned for you to see and experience the most. Getting to know Lion’s Head mountain is easy. One of our experienced guides will take you on a route to your technical skill level and abilities. If you feel like a route is getting too tough or you simply need a breather, our guides will tell you how long until the next photo and refreshments break.